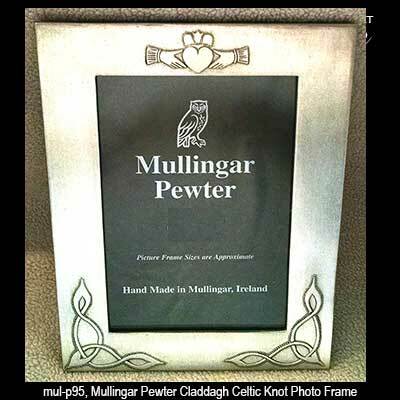 This pewter picture frame from Mullingar Pewter features the Claddagh and Trinity knots. 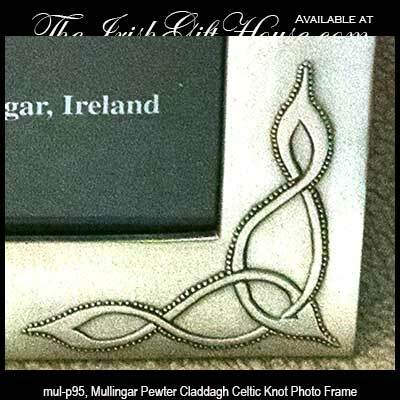 This pewter Claddagh picture frame is accented with Trinity knots and has a 3 1/2" x 5" opening for your photo. The pewter picture frame measures 5 1/2" wide x 7" tall and includes an easel for standing. This Claddagh photo frame is gift boxed with the Claddagh legend and the Celtic knot history and is made by Mullingar Pewter in Ireland.